Stroke, a leading cause of morbidity and mortality, remains an active venue for discovery. Advances in stroke neurology include prevention, treatment, and detection, in addition to rehabilitation. In terms of treatment, vast strides have been taken since the five major intra-arterial treatment trials, with extension of the treatment window in addition to the use of imaging for better patient selection. Treatment of hemorrhagic stroke has also improved in the past decade with better understanding of the pathophysiology of the disease, establishment of guidelines for blood pressure control and monitoring, treatment of coagulopathies in addition to surgical interventions. Several ongoing trials are being conducted to further elucidate the utility and efficacy of minimally invasive surgical options in deep intracranial hemorrhage. Tissue plasminogen activator is standard in the treatment of acute ischemic stroke, irrespective of stroke etiology, up to 4.5 h of symptom onset., Yet, this effect is substantially reduced in patients with strokes due to large arterial occlusions., A dramatic change in the treatment of these latter patients occurred in 2015 when five studies, using stent retrievers and carefully selected patients with large vessel occlusion on computed tomography (CT) angiography, proved beneficial in improving outcomes in ischemic strokes due to large arterial occlusions.,,,,, The Hermes collaboration, a patient-level data meta-analysis of intra-arterial stroke treatment trials, revealed that intra-arterial stroke therapy in conjunction with medical therapy improves outcomes compared with medical treatment alone, up to 7 h of symptom onset. Importantly, the effect of endovascular therapy is time-dependent from the onset of favorable imaging, that is, the sooner the reperfusion is achieved after favorable imaging, the more likely a favorable outcome will occur. The time from symptom onset is still relevant because patients arriving much later are less likely to have favorable imaging and therefore more likely to be excluded from consideration of endovascular therapy. An estimated 10%–15% of all ischemic stroke patients may be eligible for endovascular treatment based on these findings. The notion of “time is brain” is still key, with an estimated 1.9 million neurons lost with each minute of ischemia. However, many factors beside time determine the ultimate extent of injury. Such factors include collateral circulation, inflammatory response, metabolic demand, and premorbid leukoaraiosis burden. Diffusion-weighted imaging (DWI)/FLAIR mismatch on magnetic resonance imaging (MRI) and CT perfusion mismatch in the triage of stroke patient presenting beyond 6 h are potential tools to identify those who might still benefit from treatment in that frame. In May 2017, the results of the DAWN trial were announced and showed a dramatic increase in the likelihood of a favorable outcome among patients with large vessel occlusion who had a favorable imaging profile on CT perfusion., The number needed to treat to result in one more person with a favorable outcome at 3 months, defined as a modified Rankin scale score ≤2, was 2.8, one of the lowest numbers needed to treat in the history of stroke trials. An additional 2%–5% of stroke patients are estimated to be eligible for treatment based on these findings. Nevertheless, the emphasis should still be on having patients present to the emergency department as soon as possible after symptom onset because a favorable imaging profile is much more likely earlier in the symptom time window. In addition, it has been shown that time to presentation to a medical facility experienced in stroke treatment leads to better outcomes irrespective of acute stroke therapy received. This has been postulated to be the result of treatment of comorbid conditions such as hypertension, glucose control, and the administration of aspirin and statins in acute setting. DEFUSE-3, a multicenter, open label trial, has recently concluded that in select patients endovascular therapy is superior to medical therapy, 6–16 hours after ictus onset. Inclusion criteria aimed at selecting patient with better physiologic variables in obtaining better outcomes and these included those with NIH Stroke Scale ≥6, core infarct volume of <70 mL on CT perfusion or DWI, and mismatch volume of at least 15 mL on perfusion imaging. Off note, this study included patients up to 90 years of age, with subgroup analysis revealing benefit irrespective of age given the inclusion criteria are met. In addition, the DAWN trial [Table 1] included an analysis taking into account different age groups. It revealed that patients below 80 years and those above 80 years benefit from the intervention given plausible imaging., These and prior studies also used the Alberta Stroke Program Early CT (ASPECT) score as a screening tool, to evaluate for infarct volume on CT head, in cases with middle cerebral artery strokes. This score ranges from 0 to 10, whereby 10 shows no signs of acute infarction, whereas 0 represents a completed middle cerebral artery (MCA) territory infarction. One point is subtracted for hypodensity in preselected regions on the CT scan, at two distinct locations (at the level of the basal ganglia and at the level of the corona radiate). A score of less than 7 was associated with poor outcomes. Individualized patient therapy has become imperative as more data are compiled in the acute setting to aid in devising treatment plans [Figure 1]. Dynamic CT angiography of the head and neck to evaluate for collateral circulation has been developed as the latter has been shown to alter infarct volume and outcomes. Standardization and automation of image processing, ultimately facilitating decision-making, is an area of interest and development., An ongoing study from France is investigating the chronological metabolic changes after ischemic stroke through the use of sophisticated imaging techniques, which may aid in better selection of neuroprotective agents. 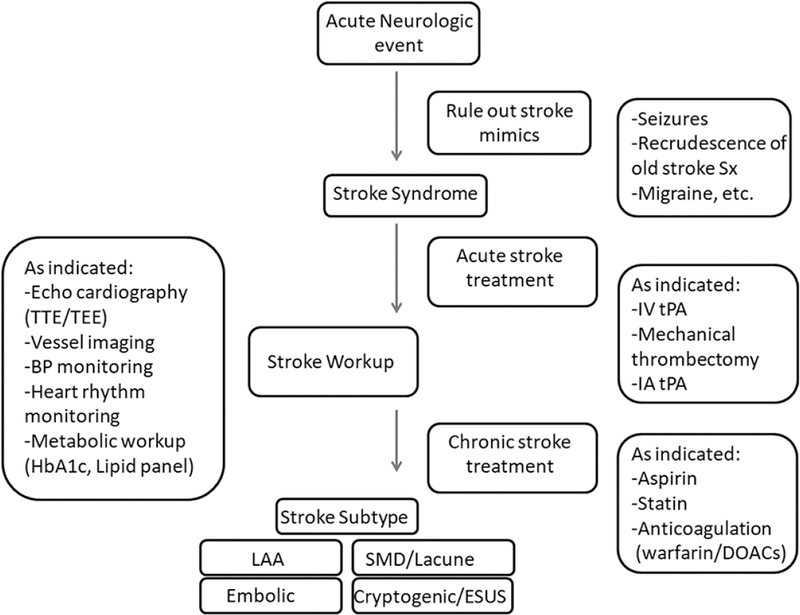 Figure 1: Suggested Pathway for Stroke Management and Workup Sx: Symptoms; IV tPA: Intravenous Tissue Plasminogen Activator; IA: Intra-Arterial; DOACs: Direct Oral Anticoagulant; TTE: Transthoracic Echocardiogram; TEE: Transesophageal Echocardiogram; BP: Blood Pressure; HbA1c: Glycosylated Hemoglobin. Concurrently, neuroprotection has gained ground with multiple ongoing trials. The FAST-MAG trial studied the potential effect of high-dose magnesium sulfate in the prehospital setting (i.e., ambulance) in patients with suspected acute ischemic stroke. The study did not show benefit or harm of magnesium administration at 90 days, yet proved the feasibility of early administration of medications prior to hospital arrival. Other recent studies with similar negative outcomes included erythropoietin, dapsone, citicoline, and albumin. Ongoing trials include statin therapy in the NeuSTART study, Tocotrienol in the SATURN study, and pioglitazone. Future trials of neuroprotection will focus on combining treatment with reperfusion therapy and therefore more closely follow protocols in animal temporary occlusion models, which showed benefit. Patients with nonvalvular atrial fibrillation (or atrial flutter) and a CHA2 DS2 Vasc score of 1 or more are at high risk of embolic events and benefit from lifelong anticoagulation. The CHA2 DS2 Vasc score is a score given to comorbidities known to increase the risk of thromboembolism in atrial fibrillation and includes congestive heart failure, hypertension, age (1 point for 65–74 and another point for >75), diabetes, history of stroke/transient ischemic attack (TIA) (given 2 points) and female gender. Historically, this was accomplished with warfarin (a vitamin K antagonist). Yet, due to the need of frequent monitoring of therapeutic levels International Normalized Ratio (INR 2–3), and the difficulty in maintaining this therapeutic range, a novel class of anticoagulants have been introduced to the market. These medications, including dabigatran which is a direct thrombin inhibitor, epixaban, rivaroxaban, and edoxaban (Factor Xa inhibitors), are as effective as warfarin with lower risks of major hemorrhages. In addition to atrial fibrillation, indications for use of the direct inhibitors include deep venous thrombosis, which can lead to strokes in the setting of a PFO, termed as paradoxical strokes. The major limitations of these medications are the lack of reversal in the event of a major hemorrhagic. Dialysis has been postulated to be effective in decreasing the active serum concentrations of said medications; in addition, dabigatran has a reversal agent, idarucizumab. New reversal agents and strategies are in the pipeline. The recently concluded COMPASS study analyzed the benefits of dual antithrombotic agents, rivaroxaban and aspirin, comparing it with single agent antithrombotic aspirin alone or rivaroxaban alone, in patients with stable vascular disease. The included patients were those with coronary artery disease and peripheral vascular disease, in addition to asymptomatic carotid atherosclerotic disease. The study revealed that combination of low-dose rivaroxaban and aspirin decreases risk of cardiovascular events including stroke in this patient population. Yet, this is offset with a significantly higher risk of bleeding. Similarly, the POINT trial  and NAVIGATE ESUS  trial recently published negative results. POINT trial investigated the utility of dual antiplatelet therapy for 3 months after TIA or minor strokes; on the other hand, NAVIGATE ESUS investigated the utility of anticoagulation with rivaroxaban for strokes determined to be embolic without an obvious cause such as atrial fibrillation. Hemorrhagic stroke, a multifactorial disease, accounts for about 10%–15% of all strokes. The common causes of hemorrhagic stroke include hypertension and amyloid angiopathy, in addition to primary causes due to underlying vascular lesions. Emergency treatment of this disease focuses on limiting hematoma expansion, such as reversal of coagulopathy and blood pressure control, as well as addressing the possibility of increased intracranial pressure. Blood pressure control in hemorrhagic strokes remains controversial, with earlier guidelines recommending lowering blood pressure to below systolic of 180 mmHg. Recent studies have contradictory findings with the INTERACT-2 trial suggesting benefit of intensive blood pressure treatment (systolic below 140 mmHg) in patients with small intracerebral hemorrhages up to 7 h of symptoms onset, and ATACH-2 trial, which studied a similar patient group up to 4.5 h after symptom and found no difference. More recent guidelines, prior to the publication of ATACH-2, recommend aggressive blood pressure control to below 140 mmHg in the acute setting. Intracerebral hemorrhage in the setting of coagulopathy, especially iatrogenic, is an occasional consequence when using anticoagulants such as warfarin or the direct oral anticoagulants. The RETRACE investigators studied the effect of INR reversal in patients presenting with vitamin K antagonist–related intracerebral hemorrhage, in a prospective cohort study. INR reversal to 1.3 within 4 h was associated with less frequent hematoma expansion and lower rates of inpatient mortality. Similarly, reduction in systolic blood pressure to less than 160 mmHg within the first 4 h after symptom onset had an additive effect in decreasing the rate of hematoma expansion. Resumption of anticoagulants after a hemorrhagic stroke is challenging for both the physician and the patient. If the decision is to resume anticoagulation, the timing of reintroduction of medication is another challenge. Moreover, the risk of ischemic stroke in atrial fibrillation and valvular heart disease is substantial, whereas the risk of bleeding is more significant closer to the inciting event., In prospective studies, resumption of anticoagulation in this patient population appears to be beneficial,, though there are no randomized trials yet. The optimal timing remains elusive and guidelines recommend restarting anticoagulation no earlier than 4 weeks. However, patient populations should be stratified carefully. For instance, it may be reasonable to wait at least 4 weeks before resuming anticoagulation in patients with atrial fibrillation who suffer an intracerebral hemorrhage, while a briefer period (notlonger than 3 weeks) may be appropriate in patients with mechanical valves, which have a high rate of early thrombosis. Several advances in the treatment of patients with ischemic and hemorrhagic stroke have occurred in the past decade. Timely thrombectomy in carefully selected patients up to 24 h can result in improved outcomes, although efforts to encourage patients to present as soon as possible after symptom onset should continue as a public health campaign. A treatment paradigm can be extrapolated in which patients diagnosed with acute ischemic stroke should undergo additional imaging including vascular and perfusion imaging, be it using CT or MRI, to further stratify the benefit and possible risk of added intervention. This should be a universal occurrence specifically in stroke designated institutions, up to 24 h of symptom onset. Limiting expansion of hematoma after intracerebral hemorrhage may prove to be beneficial with respect to improving patient outcomes in select patients although more studies are needed to better define which patients may actually benefit. Current evidence supports resuming anticoagulation in patients with atrial fibrillation or a mechanical valve who suffer an intracerebral hemorrhage. The optimal timing of restarting anticoagulation remains to be elucidated. Benjamin EJ, Blaha MJ, Chiuve SE, Cushman M, Das SR, Deo R, et al. Heart disease and stroke statistics – 2017 update: A report from the American Heart Association. Circulation 2017;135:e146-603. Koton S, Schneider AL, Rosamond WD, Shahar E, Sang Y, Gottesman RF, et al. Stroke incidence and mortality trends in US communities, 1987 to 2011. JAMA 2014;312:259-68. Jaffer H, Morris VB, Stewart D, Labhasetwar V. Advances in stroke therapy. Drug Deliv Transl Res 2011;1:409-19. Schlaug G, Lindenberg R, Seitz RJ. Neuroimaging advances in stroke rehabilitation. Eur Neurol Rev 2010;5:67. Hacke W, Kaste M, Bluhmki E, Brozman M, Davalos A, Guidetti D, et al. Thrombolysis with alteplase 3 to 4.5 hours after acute ischemic stroke. N Engl J Med 2008;359:1317-29. National Institute of Neurological Disorders and Stroke rt-PA Stroke Study Group. Tissue plasminogen activator for acute ischemic stroke. N Engl J Med 1995;333:1581-7. Smith WS, Lev MH, English JD, Camargo EC, Chou M, Johnston SC, et al. Significance of large vessel intracranial occlusion causing acute ischemic stroke and TIA. Stroke 2009;40:3834-40. Bhatia R, Hill MD, Shobha N, Menon B, Bal S, Kochar P, et al. Low rates of acute recanalization with intravenous recombinant tissue plasminogen activator in ischemic stroke: Real-world experience and a call for action. Stroke 2010;41:2254-8. Campbell BC, Mitchell PJ, Kleinig TJ, Dewey HM, Churilov L, Yassi N, et al. Endovascular therapy for ischemic stroke with perfusion-imaging selection. N Engl J Med 2015;372:1009-18. Goyal M, Demchuk AM, Menon BK, Eesa M, Rempel JL, Thornton J, et al. Randomized assessment of rapid endovascular treatment of ischemic stroke. N Engl J Med 2015;372:1019-30. Jovin TG, Chamorro A, Cobo E, de Miquel MA, Molina CA, Rovira A, et al. Thrombectomy within 8 hours after symptom onset in ischemic stroke. N Engl J Med 2015;372:2296-306. Saver JL, Goyal M, Bonafe A, Diener HC, Levy EI, Pereira VM, et al. Stent-retriever thrombectomy after intravenous t-pa vs. T-pa alone in stroke. N Engl J Med 2015;372:2285-95. Saver JL, Goyal M, van der Lugt A, Menon BK, Majoie CB, Dippel DW, et al. Time to treatment with endovascular thrombectomy and outcomes from ischemic stroke: A meta-analysis. JAMA 2016;316:1279-88. Saver JL. Time is brain– Quantified. Stroke 2006;37:263-6. Seyman E, Shaim H, Shenhar-Tsarfaty S, Jonash-Kimchi T, Bornstein NM, Hallevi H. The collateral circulation determines cortical infarct volume in anterior circulation ischemic stroke. BMC Neurol 2016;16:206. Helenius J, Mayasi Y, Henninger N. White matter hyperintensity lesion burden is associated with the infarct volume and 90-day outcome in small subcortical infarcts. Acta Neurol Scand 2017;135:585-92. Jovin TG, Saver JL, Ribo M, Pereira V, Furlan A, Bonafe A, et al. Diffusion-weighted imaging or computerized tomography perfusion assessment with clinical mismatch in the triage of wake up and late presenting strokes undergoing neurointervention with Trevo (DAWN) trial methods. Int J Stroke 2017;12:641-52. Nogueira RG, Jadhav AP, Haussen DC, Bonafe A, Budzik RF, Bhuva P, et al. Thrombectomy 6 to 24 hours after stroke with a mismatch between deficit and infarct. N Engl J Med 2018;378:11-21. Mayasi Y, Helenius J, Goddeau RP, Jr., Moonis M, Henninger N. Time to presentation is associated with clinical outcome in hemispheric stroke patients deemed ineligible for recanalization therapy. J Stroke Cerebrovasc Dis 2016;25:2373-9. Albers GW, Marks MP, Kemp S, Christensen S, Tsai JP, Ortega-Gutierrez S, et al. Thrombectomy for stroke at 6 to 16 hours with selection by perfusion imaging. N Engl J Med. 2018;378:708-18. Barber PA, Demchuk AM, Zhang J, Buchan AM. Validity and reliability of a quantitative computed tomography score in predicting outcome of hyperacute stroke before thrombolytic therapy. Aspects study group. Alberta stroke programme early ct score. Lancet 2000;355:1670-4. Bang OY, Goyal M, Liebeskind DS. Collateral circulation in ischemic stroke: Assessment tools and therapeutic strategies. Stroke 2015;46:3302-9. 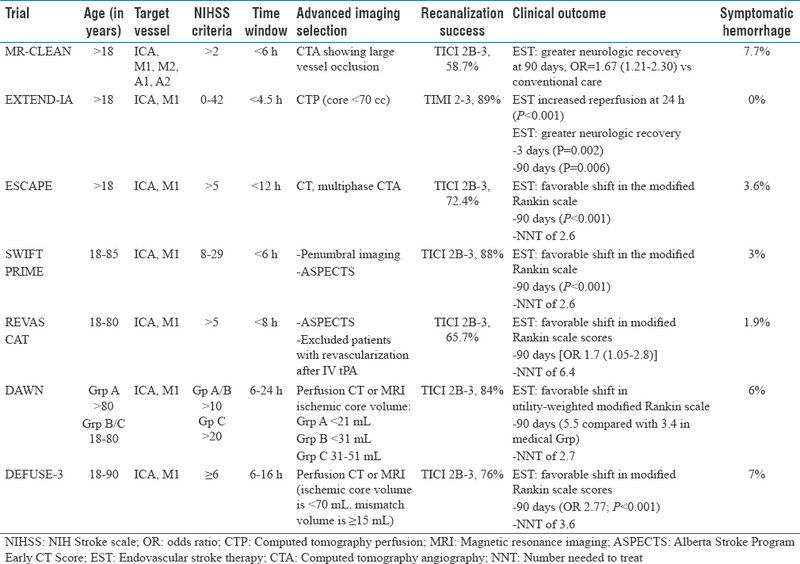 Leiva-Salinas C, Wintermark M. The future of stroke imaging: What we need and how to get to it. Stroke 2010;41:S152-3. Heiss WD, Sorensen AG. Advances in imaging. Stroke 2009;40:e313-4. Diffusion Spectroscopy in Stroke (ISIS). Available from: https://clinicaltrials.gov/ct2/show/NCT02833961. [Last accessed on 2018 Oct 12]. Ehrenreich H, Weissenborn K, Prange H, Schneider D, Weimar C, Wartenberg K, et al. Recombinant human erythropoietin in the treatment of acute ischemic stroke. Stroke 2009;40:e647-56. Nader-Kawachi J, Gongora-Rivera F, Santos-Zambrano J, Calzada P, Rios C. Neuroprotective effect of dapsone in patients with acute ischemic stroke: A pilot study. Neurol Res 2007;29:331-4. Dávalos A, Alvarez-Sabín J, Castillo J, Díez-Tejedor E, Ferro J, Martínez-Vila E, et al. Citicoline in the treatment of acute ischaemic stroke: An international, randomised, multicentre, placebo-controlled study (ictus trial). Lancet 2012;380:349-57. Martin RH, Yeatts SD, Hill MD, Moy CS, Ginsberg MD, Palesch YY, et al. Alias (albumin in acute ischemic stroke) trials: Analysis of the combined data from parts 1 and 2. Stroke 2016;47:2355-9. Elkind MS, Sacco RL, MacArthur RB, Fink DJ, Peerschke E, Andrews H, et al. The neuroprotection with statin therapy for acute recovery trial (neustart): An adaptive design phase i dose-escalation study of high-dose lovastatin in acute ischemic stroke. Int J Stroke 2008;3:210-8. ClinicalTrials.gov. Stroke and Tocotrienol: Unique Role in Neuroprotection (SATURN) (NCT02263924). Available from: https://clinicaltrials.gov/ct2/show/NCT02263924. [Last accessed on 2017 Jun 19]. ClinicalTrials.gov. Neuroprotection of Pioglitazone in Acute Ischemic Stroke (NCT02195791). Available from: https://clinicaltrials.gov/ct2/show/NCT02195791?term=pioglitazone+neuroprotection&rank=1. [Last accessed on 2017 Jun 19]. Clinicaltrials. Gov. Platelet-oriented inhibition in new tia and minor ischemic stroke (point) trial (point) (nct00991029). Available from: https://clinicaltrials. Gov/ct2/show/nct00991029. [Last accessed on 2018 Jan 4]. Sondergaard L, Kasner SE, Rhodes JF, Andersen G, Iversen HK, Nielsen-Kudsk JE, et al. Patent foramen ovale closure or antiplatelet therapy for cryptogenic stroke. N Engl J Med 2017;377:1033-42. Saver JL, Carroll JD, Thaler DE, Smalling RW, MacDonald LA, Marks DS, et al. Long-term outcomes of patent foramen ovale closure or medical therapy after stroke. N Engl J Med 2017;377:1022-32. Mas JL, Derumeaux G, Guillon B, Massardier E, Hosseini H, Mechtouff L, et al. Patent foramen ovale closure or anticoagulation vs. Antiplatelets after stroke. N Engl J Med 2017;377:1011-21. January CT, Wann LS, Alpert JS, Calkins H, Cigarroa JE, Cleveland JC, Jr., et al. 2014 aha/acc/hrs guideline for the management of patients with atrial fibrillation: A report of the American College of Cardiology/American Heart Association Task Force on Practice Guidelines and the Heart Rhythm Society. Circulation 2014;130:e199-267. Ruff CT, Giugliano RP, Braunwald E, Hoffman EB, Deenadayalu N, Ezekowitz MD, et al. Comparison of the efficacy and safety of new oral anticoagulants with warfarin in patients with atrial fibrillation: A meta-analysis of randomised trials. Lancet 2014;383:955-62. Eikelboom JW, Connolly SJ, Bosch J, Dagenais GR, Hart RG, Shestakovska O, et al. Rivaroxaban with or without aspirin in stable cardiovascular disease. N Engl J Med 2017;377:1319-30. Johnston SC, Easton JD, Farrant M, Barsan W, Battenhouse H, Conwit R, et al. Platelet-oriented inhibition in new tia and minor ischemic stroke (point) trial: Rationale and design. Int J Stroke 2013;8:479-83. Hart RG, Sharma M, Mundl H, Kasner SE, Bangdiwala SI, Berkowitz SD, et al. Rivaroxaban for stroke prevention after embolic stroke of undetermined source. N Engl J Med 2018;378:2191-201. Ikram MA, Wieberdink RG, Koudstaal PJ. International epidemiology of intracerebral hemorrhage. Curr Atheroscler Rep 2012;14:300-6. Anderson CS, Heeley E, Huang Y, Wang J, Stapf C, Delcourt C, et al. Rapid blood-pressure lowering in patients with acute intracerebral hemorrhage. N Engl J Med 2013;368:2355-65. Qureshi AI, Palesch YY, Barsan WG, Hanley DF, Hsu CY, Martin RL, et al. Intensive blood-pressure lowering in patients with acute cerebral hemorrhage. N Engl J Med 2016;375:1033-43. Hemphill JC, 3rd, Greenberg SM, Anderson CS, Becker K, Bendok BR, Cushman M, et al. Guidelines for the management of spontaneous intracerebral hemorrhage: A guideline for healthcare professionals from the American Heart Association/American Stroke Association. Stroke 2015;46:2032-60. Kuramatsu JB, Gerner ST, Schellinger PD, Glahn J, Endres M, Sobesky J, et al. Anticoagulant reversal, blood pressure levels, and anticoagulant resumption in patients with anticoagulation-related intracerebral hemorrhage. JAMA 2015;313:824-36. Murthy SB, Gupta A, Merkler AE, Navi BB, Mandava P, Iadecola C, et al. Restarting anticoagulant therapy after intracranial hemorrhage: A systematic review and meta-analysis. Stroke 2017;48:1594-600. Amin AG, Ng J, Hsu W, Pradilla G, Raza S, Quinones-Hinojosa A, et al. Postoperative anticoagulation in patients with mechanical heart valves following surgical treatment of subdural hematomas. Neurocrit Care 2013;19:90-4.